Should I Cut Off Runner Plants from My Strawberries? Q: Should I Cut Off Runner Plants from My Strawberries? I planted June-bearing and everbearing strawberries this spring. I have notes from a Master Gardener class that says to cut off the granddaughters and leave the daughters, but other sources say to cut all runners the first year. I was thinking the mother plant might be stronger and produce better fruit if she doesn’t have to send nutrition to the off-spring. I’m not sure what to do this year. I really liked your method of transplanting from bed to bed in the fall, but should I plan to do that the first year of the mother plants? Answer to: Should I Cut Off Runner Plants from My Strawberries? If you plant in the spring, it is generally best to remove the blossoms for the entire growing season. Also removing the runners will help the plant devote its full energy to becoming a strong, well-established plant. 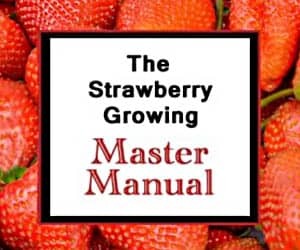 However, if you want to see the number of actual strawberry plants grow, you can allow some of the runners to root and transplant them to increase the number of plants you have that will produce the following year. The initial plants begin losing their vitality after a few years, so allowing a moderate number of runners to be established each year keeps your beds fresh for the long term. Also, I wouldn’t transplant the mother plants. Each year, the plants that should be moved to a new bed are the runners. The runners then become the established “mother” plants for the new bed, and the process can be repeated indefinitely (at least in theory!). Most home gardeners use a system called the matted row to grow their berries. This system allows you to maximize the space you have allocated for strawberry cultivation while most effectively harnessing the strawberry’s natural inclination to propagate itself. You can’t fill out a matted row without letting runners root. However, after you have filled it out with the first-year runner plants, subsequent runners will overcrowd and choke out all the plants so that the harvest declines precipitously and the strawberries become much smaller. That is probably what the Master Gardener class was conveying. Use the runners to fill your bed (so you don’t have to buy umpteen more plants to begin with), then keep the beds managed so that too many plants don’t root. Hopefully that helps, and good luck! Hi, just wondering if I should pinch off flowering strawberries? as this is my first year of growing them. I started this spring with one plant it only produced a few strawberry shortcake but I potted it into a large pot and a few runners have rooted. I want as many plants as possible by next spring so I’m leaving runners. My question is in spring I want to transplant into a mound? Is this going to work? I have potted my June bearing runners. I am aware that June bearing strawberries should be mowed down after harvest. Should I cut off the leaves on these runners after I transplant it? So I am growing strawberries in a garden area but I down like them where they are. I am letting the mother plants stay where they are for now so they can shoot out runners and then transplant those. Once I have enough I am planning on either moving the mother plants or just get rid of them seeing as they are about 4-5 years old. My question is with the runners should I let them root into the ground or should I use little pots and let them root in there. And with the mother plants can you keep them for the runners. Thanks for the time. If you are going to move them, it is easiest to do it in little pots or plastic cups or some other easily-moved container. Additionally, it is easier for the plant to be removed from a container and planted in a hole instead of being dug up from the ground and re-planted (although either way can work). At 4-5 years old, the vigor of plants really starts to decline, so berry production usually drops substantially. You can keep the mother plants for runners, but they will diminish production of those also. You’ll get more from the newer plants you plant. Good luck! If your plants are potted, it isn’t too late to go ahead and transplant them wherever you wish. As for what to do when it is cold, see this for winter strawberry plant care. Good luck! One of my strawberry has two runners and one of the runners is producing another runner! Should I keep the ‘grand daughter’? You can if you wish to do so. Sometimes runners with have 3, 4, 5, or even 6 nodes on them that can each become a healthy plant. Just make sure it has enough soil to root properly! Good luck! I put five plants in pots this spring and they are nice big healthy plants now. The trouble is, They are putting out runners like crazy. I clipped them three or four times this summer and took off 80 to 100 each time. They were clipped just a week and a half ago (mid September)and there are a bunch coming out again. Is this many runners normal? It happens, but isn’t normal. They usually don’t put out quite that many. Good luck! I live in western Washington state. Can I replant the babies that have taken root now and cut the rest of the runners off now this late in the year ? Yes, as long as the baby plants are truly established, the runner back to the mother plant can be severed. Good luck! Each runner plant that sprouts up from a node is capable of growing independently if its roots are provided enough soil and nutrients to thrive. So, if you have the space, or if you are rooting them in pots or other moveable containers, go ahead and root all of them! The more the merrier! If you are space limited or need just one or two, take the ones closest to the mother plant and sever the runner after the last one you are going to root. The nodes downstream from the cut will all die, and you’ll be able to use what you have left to transplant or root into a matted row. Good luck! I’m a little confused. I have just one square foot of strawberries that I bought 2 years ago (I transferred them after first year because I hadn’t put them in a great spot). This year they are greener and larger than ever before and sending runners out for the first time. I have the space for more plants and would like to devote a few more square feet to strawberries. Can I allow one or two runnersto set roots down and if so, can I just leave them to grow where they placed themselves (it happens to be an empty area of the garden)? Should I cut the runner or leave it connected to the mother plant? Yes, you can let the runners root where they touch down as long as they aren’t slam crammed together with other rooting runner plants. For example, if you have a plant that puts out 4 runners, you’d expect them to go out in four different directions. If, for some crazy reason, they all end up rooting within 6 square inches of each other, they’d need to be helped a bit so that spacing is adequate. If you aren’t going to move the runner plants, it is best to leave the runner intact. When the runner plant doesn’t need it any more, it will whither up and become brittle, eventually snapping itself. Cutting the runner before the new plant is fully established will either stress or kill the plant. Good luck! I want the runners will give me more plants do I need to cut off the strawberries to do that in full energy? It is possible that removing the berries will encourage the plants to produce more runners. However, the plants will typically produce a fair amount of runners regardless of whether or not strawberries are removed, so why not enjoy the fruits of your labor too?! Good luck! Thank you Mr. Strawberry for your help; I truly appreciate it! Last November I covered my strawberry plants with straw to protect them from the very cold weather and my established plants are already growing up and out of the straw. Unfortunately, I lost about 3/4 of the runners I transplanted early last Fall – I pulled back the straw and they’re completely gone! The 1/4 of them that survived are looking happy. This afternoon I dug up runners from last year’s plants that had gone over the sides of the beds and planted them in place of the lost plants. Hopefully they’ll all grow and when they start flowering, should I pinch off the flowers this year? Thank you again for all your help – sorry I’m such a novice at growing my favorite berry. If they were rooted last fall, I would let them set their fruit. Good luck! My strawberry plants (raised beds) did very well for the past couple of years. I had some friends come over last August and they dug up and took as many established runners as they wanted and I replanted a few dozen into new beds. But I still have runners and overgrown beds. Will it harm my existing plants for me to cut out runners now that it’s almost Spring? Can I cut back some of the plants that are overgrown in the beds, or is it the wrong time of year? Thanks! If you still have overgrown beds, it would be a good idea to go ahead and thin them to no more than 3-4 plants per square foot (maximum). Good luck! If you have already harvested your strawberries, you can allow as many runner plants to root as are produced by each plant, if you can use them. Good luck! Once the runner plant is established with its own roots well into the soil, you can snip the runner back to the mother plant. If you do it before then, the runner plant will likely perish. Good luck! Any way to grow a new plant from clipped runners that have the root nodules? Yes, it is possible, but most will die. To attempt it, remove all the vegetation except for 1/2 of one leaflet. Then put the adventitious root node in a perlite, moist sand, or moistened sphagnum mix (or you can purchase some seed starting mix). Keep the soil moist and the relative humidity as high as you can. Mist the leaflet/green part regularly. If the plant doesn’t succumb to fungal infection and the adventitious root node can grow, you can propagate them from the clipped runners. Most, however, will die. Good luck! is it good for the plant when repotting to trim the roots down. If you can identify any dead or brittle roots, it is ok to remove those. However, it is usually best to leave the roots as intact as possible. Good luck! I planted strawberries in a large terra cotta pot. They are doing well and producing lots of runners. Should I cut them at the joint? If you don’t want to root them, you should snip them as soon as they are identified at the crown (where they come out of the plant). Good luck!